Footings are formed in an industry standard manner with the strip drain fastened to the interior of outside footer boards. The strip drains section fit into both end of the side-out fitting [the positive stops in the side-out eliminates the chance of the strip drain overlapping in the fitting and helps to maintain a high level of water flow through the footing bleeder]. The strip drain sections fit into the sides of 90 degree corner fittings. 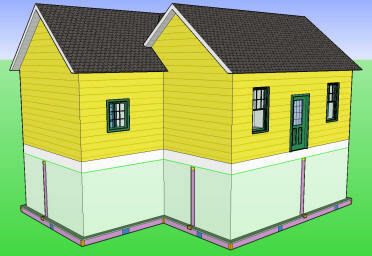 Vertical strip drains work well in critical areas where foundation walls are likely to crack and potentially leak. Beam pockets, windows and control joints are areas where crack can take place. Using the strip drain assembly you can redirect the water flow and avoid hydrostatic pressure on your foundation walls. 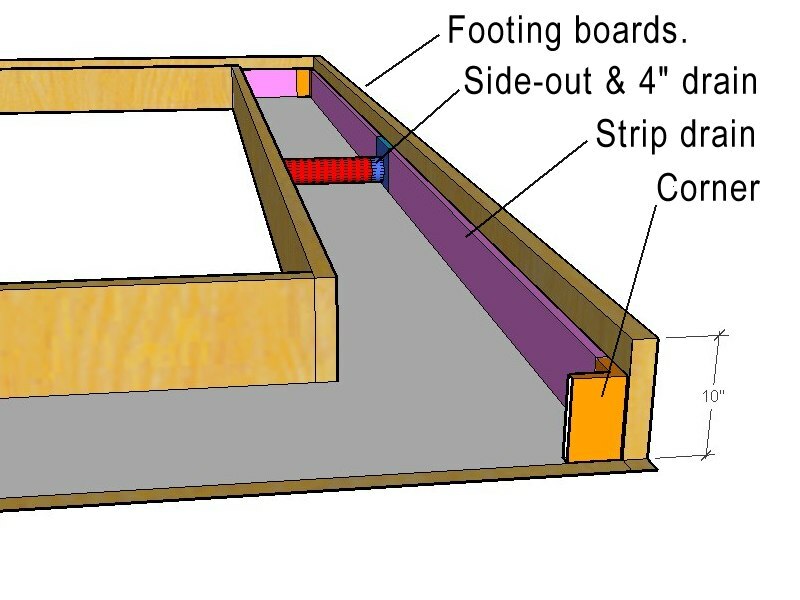 The strip drain is fastened vertical; extra strip drain material is recommend to go up to top of wall [this is extra material is to be field cut after backfill and when doing final grade later with the end cap is to be placed on top of the strip drain; one or two inches below final grade]. 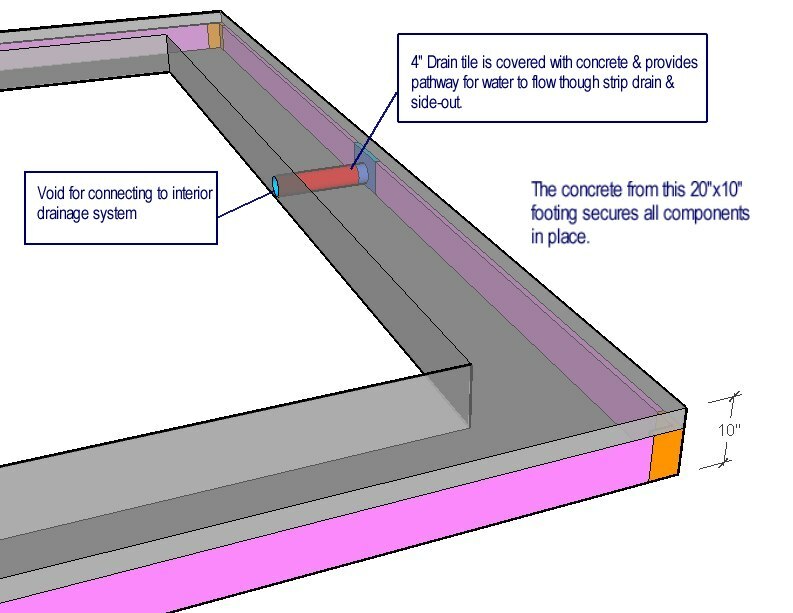 The strip drain is bent at a 90 degree angle where the wall and footing meet and then the strip drain connects to the 90 degree corner fitting that directs the water flow to the footing strip drain. Note: That the vertical drain strips work great over control joints for added protection from moisture penetration . The footing assembly is detailed in the sections below. Footings for foundations are railed as normal. Then the Great Lakes Drain System™ system is placed inside the footing rails. Corners, Strip Drains, Side-outs and 4" Round drain tile are attached to the interior face of the outside of the footing rails. Semi-transparent view of footing after footer boards are removed. After the footings are poured, the footing form rails can be removed. Then you will be able to see the Strip Drains sections, Corners and Side-outs. The 4" Round drain tile will be concealed by the footing concrete [there should be round voids on the interior for connecting interior drain tile system.